Fall flavors are in full swing. I was craving squash, as you do this time of year, and found this recipe which was SO FREAKING GOOD. Trust me, just make it. And pair it with this yummy Anaba Chardonnay. I’m not normally the biggest fan of full-bodied California Chards, but damn this was perfect with this dish – baked apple, spicy cinnamon but balanced with some lemony acid. The Wente clone you see them talking about on the label is the clone of vine that most Cali Chards come from – the cuttings were imported from Montpelier, France in 1912. Enjoy! PS I added some shallots to the recipe. Big fan. Not necessary but added a little sweetness and extra flavor. 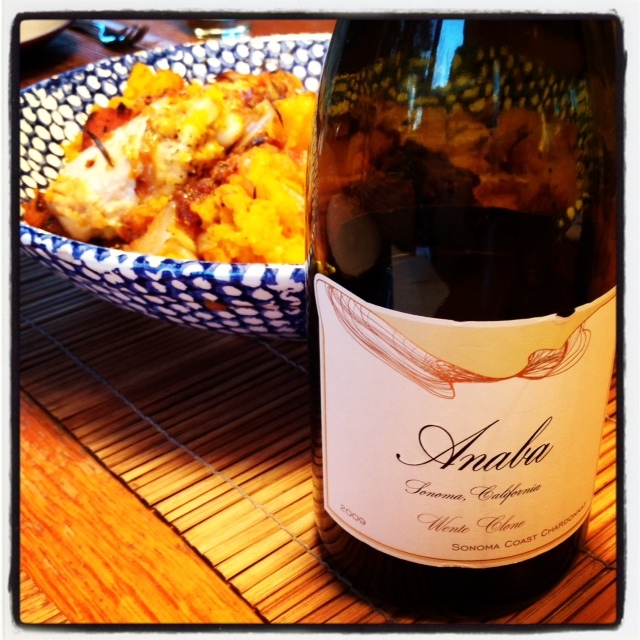 Tags: chardonnay, chicken, fall, food & drink, recipe, sonoma, squash, wine. Bookmark the permalink. Previous post ← happy fall happy hour! We LOVE Anaba in Sonoma. The first time Kathy came to visit me (Christina) we both had such a good time there and really became friends…that led to us writing a blog! Great wine and I cannot wait to try the recipe. I love fall food.